The Church of Scientology is on record stating that Narconon is secular, and in no way related to Scientology. This is blatant misrepresentation, Narconon is Scientology: the proof at Narconon Exposed. "... particularly including the promise to actively use the [Narconon trademark] in advancing and disseminating the Hubbard Philosophy and Technology in accordance with [Hubbard's written and recorded spoken works] in [Narconon Rehabilitation Center's] field and to promote and protect the Hubbard Philosophy and Technology"
stop-narconon.org: "Narconon Stone Hawk: The Ugly Truth"
Narconon watchers (Mar. 28, 2007): "Narconon Stone Hawk: a close look at the numbers"
The number of clients increased 150% (160 to 400). Keep that 150% number in mind, since it should be used as a reference to judge whether the other numbers 'make sense'. Note that we would normally expect economy of scale with regard to costs. The Wog Blog (Mar. 17, 2007): "Who's Up for a Debate?" Not Stone Hawk Narconon. Vince Daniels offered to have an in-studio debate with Per Wickstrom and Clark Carr but they refused to appear on the show. I wonder why? To combat Vince’s many effective shows on the abuses at Narconon’s Stone Hawk rehab facility, Stone Hawk has purchased an hour of radio time each Saturday morning for a month to spread their PR nonsense. Wickstrom hops on a plane to come do their little show each week but can’t stick around an extra few hours to answer questions. Dave Touretzky (Mar. 16, 2007): "A look inside Narconon Stone Hawk's finances"
Perhaps someone would like to go through this and post a summary of the most interesting parts? Dave Touretzky (Mar. 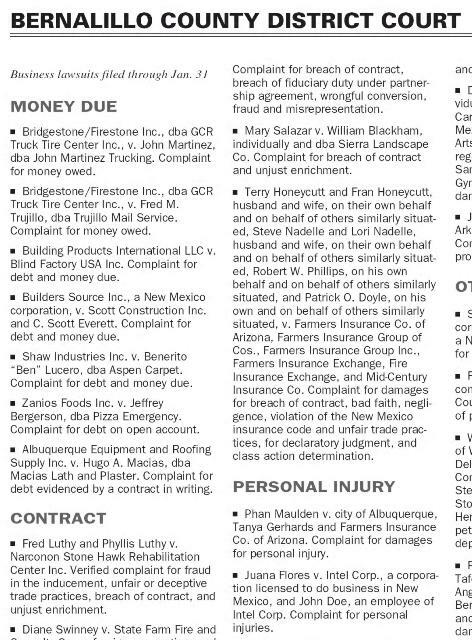 16, 2007): " Narconon Stone Hawk sued for fraud"
Fred and Phyllis Luthy of Albuquerque, New Mexico have sued Narconon Stone Hawk for fraud, deceptive trade practices, and unjust enrichment. According to the complain, they sent their son John to Stone Hawk in August 2006. He lasted 5 days before being dumped at a motel. Narconon not only kept the $23,500 "tuition" charge, they even kept the $1,500 that had been placed on account to meet John's expenses during the 4-6 month program. Note that although Stone Hawk is located in Michigan, the lawsuit was filed in New Mexico. The Luthys are arguing for home state jurisdiction on the grounds that they were solicited by telephone multiple times at their home in Albuquerque. Assuming they are successful in keeping the lawsuit in New Mexico, this will bode well for others wishing to sue Narconon without having to go to the trouble of finding a Michigan attorney. The Luthys are seeking TRIPLE DAMAGES and PUNITIVE DAMAGES based on the deceptive trade practices charge. The complaint alleges that John Luthy received no treatment while at Narconon Stone Hawk; he was simply left to suffer through his withdrawal symptoms. At least they didn't ruin his liver with a niacin overdose. Dave Touretzky (Mar. 14, 2007): "More trouble for Narconon Stone Hawk"
Things aren't going too well at Narconon Stone Hawk in Battle Creek, Michigan. A source inside the facility tells me that 10 students have left in the last couple of weeks. As the word gets out about this place, students are being yanked by frightened parents. Per Wickstrom's trick of dumping students in cheap hotels and then refusing to refund their money has gotten him into some hot water. A family in New Mexico has filed suit against Narconon Stone Hawk for "unjust enrichment" after they dumped their son and kept the money. That's lawyer talk for "you ripped off my client and we're going to make you wish you hadn't." I've been hearing from a stream of dissatisfied Stone Hawk customers recently. I can't post details here, but let's just say that Vinnie has enough Narconon material to keep him busy from now until Christmas. And what does the Michigan Attorney General think of all this? Enquiring minds want to know. The Wog Blog (Mar. 3, 2007): "Vince Daniels Not Shuddered Into Silence"
All attempts to silence Vince Daniels on the topic of Scientology and Narconon have failed. He once again has taken on the issue after Stonehawk’s officials have spent the week lying about the Scientology connection and trying to do damage control. The Wog Blog (Feb. 25, 2007): "Stonehawk Responds"
No connection to Scientology? Unbelievable. It is Scientology through and through. Listen to the last Vince Daniels show. The patients reveal that the same training routines are used, the same BS Hubbard policies of Ethics Officers and overts. I was stunned by all the Scientology jargon I heard from these former patients. The Wog Blog (Feb. 24, 2007): "Beneath the Planet of Vince Daniels and Stonehawk"
[...] Segment two features features Kimberly Darr and Sheri Koenig from last week’s show. Kimberly’s fiancée, Dave Bowser, left Stonehawk recently. Sheri’s fiancée, Daryl, was kicked out of the the facility immediately after last week’s show aired. He was dropped off at a motel 20 miles away with a few dollars in his pocket. Sheri had to drive 11 hours through a snowstorm to pick him up. The Many Mood of Vince Daniels (Feb. 24, 2007): "Clean and Sober"
VINCE DANIELS: [...] I received 3:30 the other morning, Friday morning, a letter. I can't identify this guy but he's an employee of Stone Hawk and it says right here. First off, I need to know that my name will not be used because I am still employed with Stone Hawk and need my job. Next, I have listened to the show that aired about a week ago and I wanted to add my input. One of your callers stated that the guards were involved with getting the students drunk and high. This is not true. The security officers were not involved until it was discovered that the students were using. The employee that did supply the alcohol and drugs is, in fact, Kate Wickstrom's brother. He was accepting sexual favors in exchange for the alcohol and drugs. VINCE DANIELS: There are two different centers. There is the Withdrawal in the second half and Albion and the Sauna in the first half in Battle Creek. So the students start out in Albion until they leave Withdrawal, then they go to Battle Creek once they get to a certain point in their program and they come back to Albion to finish. Battle Creek is just plain nasty and, yes, they do have ants and spiders throughout the center. The carpets, furniture are gross with cigarette smoke and burns. When it rains, the roof leaks in several different areas of the building. Stone Hawk has not paid many of their bills. That is why the trash piles up. They require us to wear uniforms and when they turn them in to be cleaned they keep them instead because Stone Hawk has not paid their cleaning bill. They allow the students to place orders for things they need or want. Before they were using--I guess the store is Meijers, M-E-I-J-E-R-S--up until about a month or so ago. I guess Meijers is a pharmacy place out that way? And now they're using Kmart. They never gave a reason why the switch but I know that it's because of them not paying their bill. There had been at least ten different employees that have had their paychecks bounce on payday and this has happened more than once. I know one employee that had his check bounce every week for a month. There are very few of us working here that have not been through the program already. The only reason that I continue to come to work every day is for the kids that are here. I try to comfort them and to get them out of here. This is just some of what goes on around here, and he gives his name. The Wog Blog (Feb. 17, 2007): "Vinnie Has Stonehawk Cornered"
Albuquerque Journal (Feb. 9, 2007): "Bernalillo County District Court"
Fred Luthy and Phyllis Luthy v. Narconon Stone Hawk Rehabilitation Center Inc. Verified complaint for fraud in the inducement, unfair or deceptive trade practices, breach of contract, and unjust enrichment. Narconon Victims (Jan. 26, 2007): "Greg Beha settles"
Two days before he was to appear on the Vince Daniels show, Mr. Beha contacted Daniels to inform him that he received his refund, apparently with a gag order. While we congratulate him on getting his money back, his is one more voice silenced. Someday, it is hoped that someone will come forward who will not agree to a gag order. We lost the skirmish, but the war's not over. Greg Beha (Jan. 22, 2007): "Open letter to Narconon"
When my step-son called and told me that he wanted out and that Narconon had Scientology beliefs, I thought that he was just a drug addict wanting out. I told him that I didn't care what they were teaching him, and what beliefs they inflicted on him just as long as he comes home without an addiction after 3 to 6 months. After 18 days you dropped my step-son off at a motel with $10.00 and "washed your hands of him". Barbara Graham (Jan. 5, 2007): "My Son the Junkie"
It happens all too often. A family member gets in trouble with drugs. Concerned relatives or friends begin looking for a good rehab program. A web search results in hundreds of websites, all from the same source, Narconon. Some may associate the name with a 12 step program, like Alanon. One might also think that, with so many websites, these people really must know what they are doing. Who would ever suspect this to be a recruitment branch of the "church" of Scientology? Greg Beha is one such concerned parent. He called Narconon Stone Hawk, a large facility in Michigan, and arranged for his son to enter their program. He paid $23,000 up front for a "3-6 month program." The Wog Blog (Nov. 4, 2006): "Vince Daniels In a Fine Mood"
[...] Following Tory on the show was a segment featuring Professor David Touretzky and Greg Beha whose son was admitted to Scientology’s drug rehab program, Narconon. After making a disparaging remark about L. Ron Hubbard, Greg’s son was kicked out of the program and dumped at a seedy motel with a ten dollar bill. Mr. Beha is attempting to get a refund from Narconon. Greg Beha (Sep. 13, 2006): "Open letter from the parents of one that was treated at Narconon - then mistreated"
[...] On July 2, (2 days into Detox) our son passed out and was vomiting blood, the [Registered Nurse] at the center would not let him go to the hospital. Our son finally convinced them to take him to the hospital. They said they would take him AMA (against medical advice). At the hospital they said he was dehydrated and started him on IV’s. After going back to Stone Hawk, he finished the detox withdrawal part of the program. Our son started the next phase of the program (Therapeutic Training Routines Course) which teaches one’s ability to confront and communicate. The Windsor Star (Jun. 5, 2006): "Presley aids Scientology addiction recovery home"
Priscilla Presley helped inaugurate the 120-bed Narconon Stone Hawk East residential center in Albion, Mich., Saturday. Narconon is based on principles developed by L. Ron Hubbard, founder of Scientology. Presley is a Scientologist. The Narconon program is "capable of eliminating the very cravings that drive addicts in recovery back to drugs," Presley said in a statement. Petoskey News-Review (May 20, 2005): "Petoskey planners reject drug rehab home"
Wickstrom noted that TIA's Narconon programs are not affiliated with the Church of Scientology. The Stonehawk center is currently at its capacity of 100 clients and has a waiting list, Wickstrom said. The Battle Creek location currently has state licensing, and she added that the same would be pursued for the Petoskey center. Petoskey News-Review (Apr. 20, 2005): "Comments sought on drug rehab center"
Kate Wickstrom, the owner of TIA Corp., said she was not surprised by the denial. "I think it is just a misunderstanding in the public what addiction is. Addicts are not criminals. These people came to us for help. They want to be there," she said. TIA Corp. owns a similar Narconon facility in Battle Creek. Narconon is a drug and alcohol treatment that does not use other drugs to help clients kick their addictions. Battle Creek Enquirer (Jan. 2003): "Stone Hawk rehabilitation ready to open"
A drug and alcohol rehabilitation center is set to open at the end of January in Pennfield Township. All of the remodeling at the Narconon Stone Hawk Rehabilitation Center, 216 St. Mary's Lake Road, has been completed and the center's first 20 patients should begin their stay Jan. 31, said Kate Wickstrom, executive director of the rehabilitation clinic. "All of the contractors are done now," Wickstrom said. "There's furniture in the rooms, we're getting the kitchens ready, ordering the food - we're ready to rock and roll."